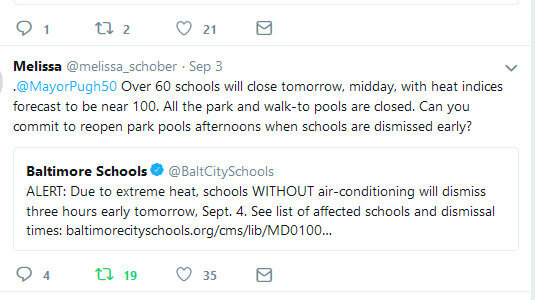 Last week, with students still on summer break and Baltimore sweating out a heat wave, parents and others told The Brew they couldn’t understand why most public pools were closed. 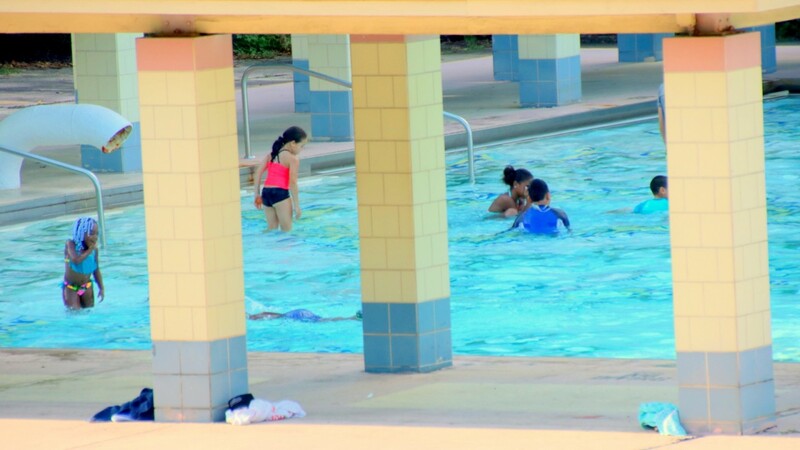 Under the Department of Recreation and Parks schedule, the six pools at city parks were open, but the 12 pools out in the neighborhoods had already closed for the year. Why not leave all city pools open through the Labor Day weekend, some parents asked, especially with the heat wave forecast to continue? The parents spoke up again on Labor Day evening (Monday night) with fresh resolve. With the new school year about to start the next day, officials were announcing online that thousands would be sent home early from poorly air-conditioned school buildings. Yesterday – with the heat still blistering and children sent out into it at midday – Pugh responded. She instructed Recreation and Parks to re-open the six “park pools,” along with recreation centers, at noon. It was her only good news of the day, said Tonya Albertson, heading to the Druid Park Pool last night with her two young daughters. “My house is hot, my kids’ school was hot, my day was totally messed up having to leave work and pick them up,” said Albertson, whose children attend one of the schools that dismissed early, Matthew A. Henson Elementary School. With the high heat and humidity forecast to continue through tomorrow, most of the city schools that dismissed early yesterday were scheduled to do so again today. Riverside, Druid Hill Park and Patterson Park. Meanwhile in Annapolis and on the campaign trail, the situation fueled dueling press conferences and finger-pointing. Ben Jealous, the Democratic nominee challenging Hogan in the November 6 election, said the Republican incumbent should be doing more to help fund repairs. “This is not a time for a governor to be casting aspersions and throwing local leaders under the bus,” Jealous said.